iDisplay — $4.99 in the App Store — works using Wi-Fi, not a cable, and you don’t have to invest in a fancy video card with two outputs. Instead, you download and run the iDisplay app on both your iPad and your Windows 10 PC. Go into the Windows app, find the iPad, and start the iDisplay app on it. Stick the monitors side by side (see the figure), and you can click and drag from one screen to the other. 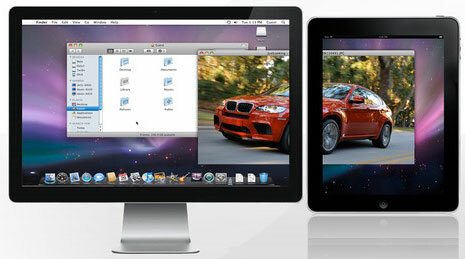 iDisplay extends your Windows PC’s desktop without a fancy video card. iDisplay is best suited for shuffling relatively static information off to the side of your screen — all the bits have to travel by Wi-Fi, and they don’t move quickly. You can use iDisplay to run TweetDeck on the side of your screen.